If you like chicken salad, you are going to absolutely love this recipe. Diced chicken mixed with creamy avocados, crunch celery and onions and a hint of sweetness from a diced apple. 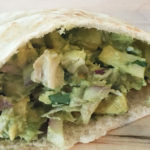 No mayo chicken salad served in a pita – a quick and healthy lunch. Throw in a little cilantro and lemon juice and you have yourself a delicious and healthy lunch! Because this chicken salad recipe contains no mayo it is dairy free and can be eaten by those on a paleo diet. If you are gluten free just add the chicken salad to a bed of lettuce or with gluten free bread or crackers. As a quick and easy lunch idea, pack the chicken salad in an air-tight container and bring along half of a pita bread. When you are ready to eat, place the chicken salad in the pita bread – a quick, easy, and healthy lunch. In order to achieve the creaminess typically found in chicken salad recipes, you will want to use ripe avocados. So how do you know when you have the perfectly ripe avocado that is creamy on the inside but doesn’t have any brown spots? The best way to determine an avocado’s ripeness is by checking under the stem. At the top of the avocado peel back the small stem to see what it looks like underneath. If it falls off easily and still green underneath that means that the avocado is ripe and ready to eat. However, if you pull the stem off easily and the skin is brown, that means that there are probably brown spots inside. Finally, if it is difficult to pull the stem off, the avocado needs a few more days to ripen. You can also help to determine the ripeness by the color and firmness of the fruit. Ripe and ready to eat avocados will have a slight give to it when gently squeezed and they will have a deep dark skin color. 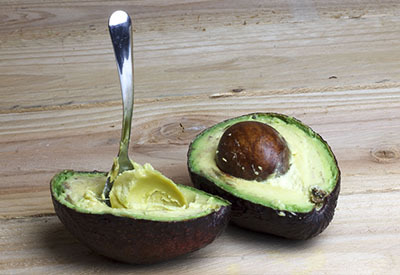 Under ripe avocados are typically brighter green in color and firm to the touch. And over ripe ones will squeeze easily with the lightest touch. Simple and healthy no mayo chicken salad ingredients. Adapt this recipe to your liking or use what you have on hand. No lemon juice, no problem. Use lime juice instead. If you like things a little spicier, add a diced jalapeno. And if you aren’t quite ready to give up the flavor of mayo, use a combination of one avocado and 1/4 cup mayo. Substitute the mayo with greek yogurt to keep it even healthier. 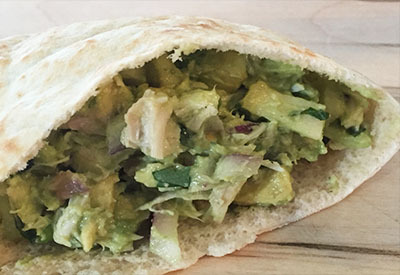 If this recipe sounds good to you, be sure to check out our Avocado Chicken Salad Recipe. Creamy chicken salad using avocados instead of mayo. A healthy dish that can be served with celery for a snack or with bread for a meal. 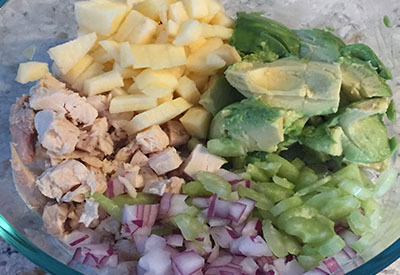 In a medium bowl add the chicken, avocados, apple, celery, and red onion. Mash the avocados with a fork and stir the mixture together. Add the cilantro, lemon juice, salt, and pepper and stir well. Add additional lemon juice, salt and pepper to taste. Serve with pita bread, bread, crackers, or celery. Store in refrigerator with plastic wrap directly on top of salad mixture in an air tight container for up to 3 days. Substitute tuna fish for the chicken if desired.